We stopped in Airlie Beach for four days on our East Coast tour, wishing to explore the pretty area of the Whitsunday Islands. The Withsundays were discovered and named by James Cook in 1770. Apart from sailing between the islands and seeing the famous Whitehaven Beach, with its white 98% pure silica sands, Airlie Beach is also a departure point for excursions to the Great Barrier Reef. Because most of the tourists take off in the morning on sailing trips, the town is pretty quiet during the day. It comes back to life in the afternoon when the sailing boats return "back to Australia". The beach in Airlie Beach was unswimmable when we were there as it is visited by the box jellyfish from November to May. The place to swim in town during those months is the small lagoon (or the hotel's pool of course, if your hotels happens to have one). There's plenty of accommodation to be found in Airlie and I might add for all budgets. 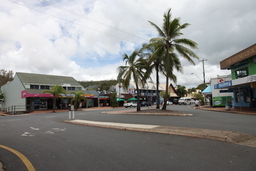 The main street of the town is called Shute Harbour Road and along it you'll find plenty of shops and restaurants. I could have stayed in Airlie Beach a lot longer. But who knows, maybe I'll be back someday.